You might be asking: What happened to logmein backup? But don’t worry – in 5 minutes you could be installing your new custom branded white label backup solution, get started on a free trial now. Are you a LogMeIn Backup User looking for a replacement online backup solution? 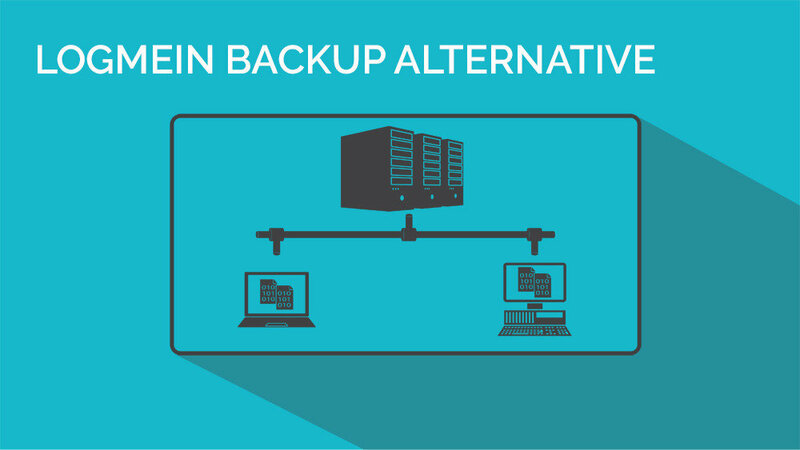 As a result of LogMeIn Backup announcing End of Life for its online backup product, many are on the search for a replacement online backup solution. Why are you shutting down LogMeIn Backup? Our product development efforts at LogMeIn have always centered on enabling employees and individuals to simply and securely connect to their devices, applications, and files. In an effort to focus on our current products and development efforts, we are removing LogMeIn Backup from the LogMeIn product portfolio. What is my LogMeIn Backup expiration date? As a Backup user, you will have access to your LogMeIn Backup account until April 26, 2018. How long will I have access to my LogMeIn Backup account? You will have complete access to your account until April 26, 2018. Plan to modify your backup sets before that date. … Let WholesaleBackup make this process easy and simple as possible for you. WholesaleBackup has been helping online backup service providers and creating white label backup software for 15 years. We offer the most competitive pricing and the most responsive free US support and training for getting your backup platform custom branded and deployed within minutes. 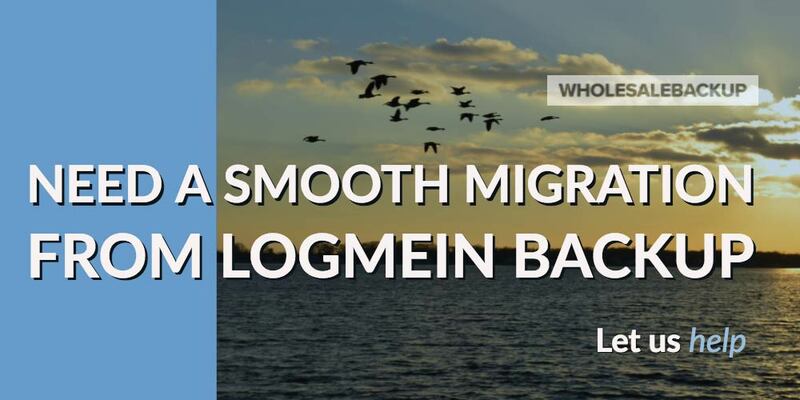 Need a smooth migration from LogMeIn Backup? Let us Help! Ability to backup accounting, POS, medical, dental, legal software applications and data. Good news WholesaleBackup provides all of this for you straight out of the box, no upselling or nickel and diming. Your free trial has all of these features available to test right now. Once you have generated your installer package directly from your WholesaleBackup web console you simply deploy it on the customer machine, set the selections and the time when the incremental backup service should kick off. Then you can simply monitor the backups from the backup management web console. Also its good to note that since you’re starting from scratch you’ll be creating the initial seed which will take the most time, but this process can be made much easier by letting the backup software runs silently and continuously in the background, since you also have the ability to limit/throttle the bandwidth used by backup software during business hours, the customer doesn’t feel any interruption or competition for resources while the backup is running delivering a smooth transition to your end user. Once the initial backup seed is completed and you’re ready for nightly incremental backups, you can simply make a small tweak to the backup client settings remotely from the web console to remove the throttle settings and not interrupt the user. If you choose to host the backups on your own Server you can actually perform a local backup to a portable drive and then transfer it to your own backup server, then resume incremental backups from that uploaded seed. If you choose to host the backups using Amazon S3 you can use an AWS Snowball device, perform the local backup on to it, get it shipped to AWS and then resume incremental backups from that seed. If you’re using LogMeIn Backup currently then you’re likely aware they are not going to be supporting the latest Windows OS’s, which is a big problem for their resellers. We have been selling and supporting online backup service providers for more than ten years. If you’re looking to make a change and migrate to a platform that fully supports Windows 8, Windows 10, and Windows SBS (Small Business Server) 2012, then get started with a WholesaleBack Remote Backup Solution we have free trials available. WholesaleBackup has been serving the backup industry for over 10 years, we understand the needs of the backup service provider, and will work with you to make sure you are successful in helping you take care of your clients backup needs when using our white label backup software, because we succeed when you do. When using our backup software you can host the backups on your server or you use one of the new cloud storage options, which leverage Google Cloud Storage or Amazon S3 Cloud storage, the choice is yours. Get started on one of our free trials today.